Statistics reveal that there were about 2.2 million apps in the app store till 2017. The number has grown from 800 apps in the month of its launch in July 2008 to 2.2 million in January 2017. Along with the numbers iOS app development trends also keep on changing every year. Apple last year in December released its latest update on iOS 11 that made everyone crazy behind the features that it brought up. Let's take a look and check out what is going to happen with iOS app development industry in 2018 and beyond. Apple Pay: Apple Pay will keep on growing in 2018 and dramatically affect business. Apple Pay, a digital online mobile wallet makes it simple for iOS users to make payments. Furthermore, it will support each of the iOS devices including iPhone, iPad, iOS watches and Mac laptops. With acknowledgment of only 3 percent of U.S. retailers when launched, the Apple Pay is currently upheld at 50 percent of stores. According to the stat, there has been an inconceivable hike of around 500% on transactions utilizing Apple Pay. It is currently one of the world's most acknowledged contactless payment technology. Augmented Reality: The most important and highly hyped update is the augmented reality apps. iOS application developers will have the capacity to create 3D and virtual reality-based mobile application with AR. In fact, ARKit will also be going to get sufficient help from Amazon's Sumerian application platform which will permit the iPad and iPhone application developers to develop augmented reality, virtual reality, and other 3D applications. In addition, numerous other organizations are additionally investigating a similar alternative making 2018 a productive year for AR and VR applications. Apple HomeKit: HomeKit is a system of Apple Inc. that is exceptionally designed for home automation. The thought behind this system is to allow the smart devices of your home to communicate with each other. Furthermore, here Siri can be utilized to command them. For this reason, iOS developers can develop applications utilizing Apple HomeKit that enables the connected devices to follow their commands activated by them or utilizing Siri. In fact, a centralized application can be created so as to streamline the entire home automation process. File Management: With the release of iOS 11, there are numerous highlights which are energizing and also trending. One of which is the file management utilizing an application called, "Files". With this application, the iOS users are permitted to manage different cloud applications into one single location. You may store your introductions on GDrive, personal images & videos on Dropbox, and so on. With the Files application, you can make a single dashboard where you can really deal with stuff that you store on these cloud applications. Core Machine Learning: Core Machine Learning is one of the most widely discussed trends in iOS app development. Apple iPhone developers can make utilization of this Core ML in any of the iOS applications to make it more feature rich. With its robust library, the Core ML will offer communication applicable to all iOS devices and furthermore will be valuable for face detection. Security will also be improved with the applications that identify faces to work on certain functionalities. iOS has always been in trend and news and all thanks to Apple and its customer services for that. Apple always has something or the other for its high-esteemed users. And, that is what helps our iOS developers to continue running and creating incredible and trending apps. 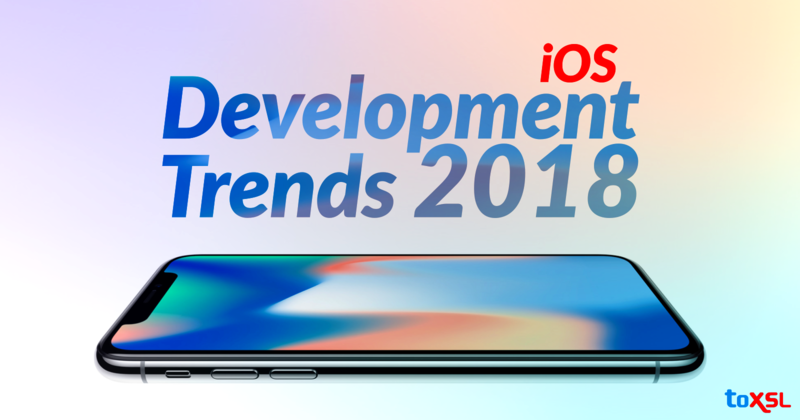 What according to you will be trending for iOS app development trend in the year 2018? Share your thoughts in the comment section below.